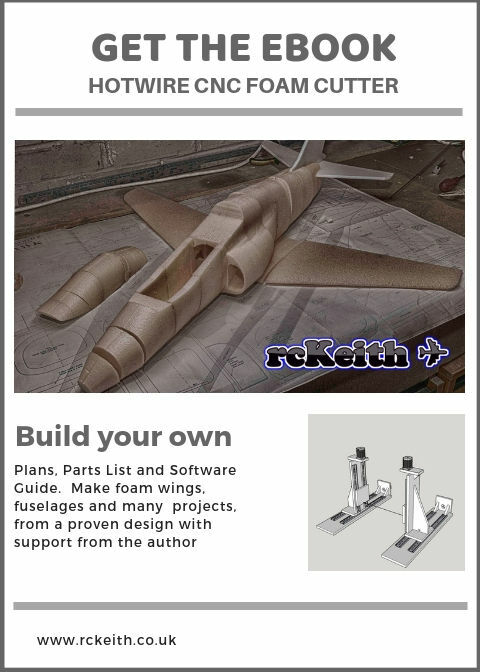 Here are files to make the BAE Hawk or T45 Goshawk with a Hot Wire CNC Foam Cutter. These files are based upon my Video Tutorial for DevFus Foam 2. If you don’t have a CNC foam cutter you can build one quite easily if you follow my build articles listed below. I’ve made a few modifications since Part 3 of the series to get a better shape. You will need to set the distance of the tower as specified in the g-code file. I’ll explain the setting in the files later in the article. With these files, you don’t need a license for DevFus Foam 2 just load the g-code into your CNC foam cutter. I’ve created the g-code with my license for you. The only caveat is that your machine has to set the same as mine and the model will have a 650mm wingspan. This will give you a chance to see what Devfus can do before you invest your hard earned cash. I would advise practising on some scrap foam first. You can load the project file into the Demo version of DevFus Foam which may be a good idea anyway. I’ve used 60mm XPS foam but a couple of the blocks require foam of smaller widths, jut cut down the foam to the correct size first. You need to make sure the hot wire is working on a distance of 250mm between the pivot points. This may not be the distance of the physical left and right towers are apart, mine are a little further out. After some testing, I found I had some issues using a spring to keep the tension on the wire. So I’ve converted to a pulley and weight system which works much better. Using 0.6mm ni-chrome wire I set my iCharger 206B to 2.6 amps around 13-14 volts for XPS foam. You may need to adjust this if you are using another type of foam. Run a few tests first. To make it a bit simpler I’ve included an HTML file that goes with the g-code file of the same name. The main concern is getting the foam block in the right position and big enough to make all formers. Luckily the size of the foam we need to start with is given. I measure out a suitable piece and cut it to size with a hand held bow using a guide to keep the cuts square. My bow uses a ni-chrome wire and two pieces of wood mounted on a longer price of wood. Check Part4 in the video series I power this bow with an old car battery charge with a house light dimmer switch. I can adjust the current to around 2 amps on the meter. It’s much easier to size the block like this. Then I mark the middle of the block and draw a line with a sharpie pen. The blocks need aligning so that they are the same distance between the towers. Coming very soon still testing the g-code. Sou do Brasil gostaria de saber se existe possibilidade de fazer esse aviao cortado com fio quente de modo manual e uma ajuda por favor se ouve como teria jeito de me ajudar a decifrar quais medidas eu usaria pra saber posicionar os moldes tais como aluturas e comprimentos eu construo aeromodelos em modulos porem nao tenho cnc obrigado. It would not be really possible to make the aeroplane fuselage with a manual hotwire. If you purchased DevFus Foam you could output all the formers in DXF format and then print the outlines with a free CAD program. But you would need to make 2 templates for each former, there are 14 formers in this design. The wings are much simpler and could be made with templates. CNC is the best option. 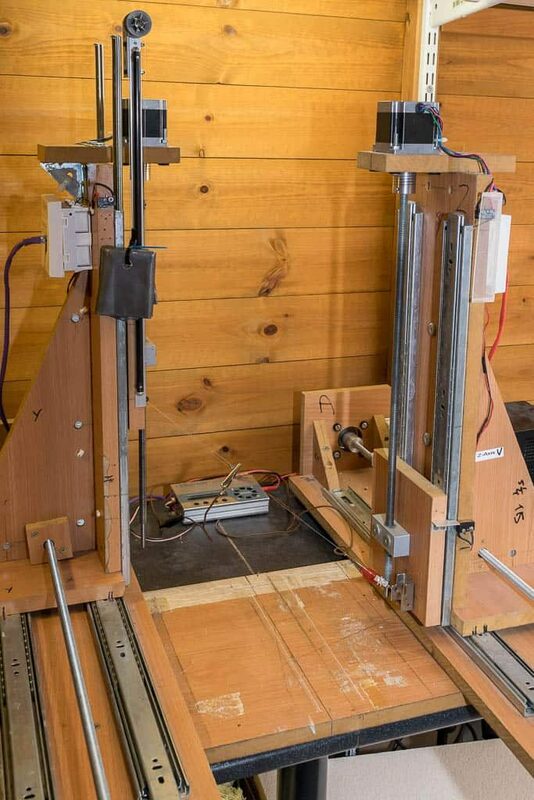 I’m designing a new CNC foam cutter machine which should be cheaper to build and should be ready later this year.